IF has been cooperating with Watsonville Wetlands Watch (WWW) since 2017 by helping to finance stipends for three mentors who, after training, instructed over 100 grammar school students. Watch this wonderful introductory video to see what Watsonville Wetlands Watch is all about! 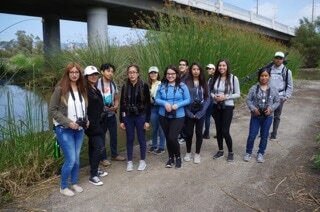 The IF board was recently invited to join a school tour with the Watsonville Wetlands Watch. 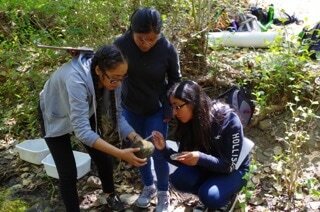 IF has supported their Wetlands Steward Program for the past two years and our grant funds intern stipends for six high school students from Pajaro Valley High School. IF Board Chair, Phil McManus, observes local school children participating in an auditory sensing game. These interns served approximately 400 Pajaro Valley elementary and middle school students in the eight-week wetland exploration program. Staff educators, supported by interns and their elementary and middle school mentees spent many afternoons exploring the Pajaro River watershed from Corralitos Creek through the Watsonville Wetlands and down to the Monterey Bay. The Fitz Wetlands Educational Resource Center is an equipped lifelab classroom where students can get up close and personal with native plants and animals. Each May, the high school interns graduate from the Wetland Stewards Program, (totaling 87 students who have graduated from the year-long program this far). Some of these students are high school seniors and are now attending schools like San Diego State, UC Berkeley and UC Davis. IF board member, Adrienne Frisbee, participates with a young student in the field. Every project IF supports is assigned to a board member to act as a liason. Adrienne is our liason for the Watsonville Wetlands Watch project and coordinated our fantastic tour. The project coordinators are excited to report that these graduates are now choosing college majors in environmental fields and returning to visit the current high school interns to share their first semester of college experiences and advice. IF Founder, Bill Cane, enjoys bird watching with a young friend on the field tour. Students testing the health of the water in the wetlands. Watsonville Wetlands Watch Wetlands Stewards program hires 12 Pajaro Valley High School students as interns to teach a hands-on after school program for elementary and middle schools in Watsonville. These interns learn about the plants, animals, and ecology of the wetlands along with methods to teach this material to younger students. The Wetland Steward interns lead elementary and middle school students in activities such as kayaking, water quality testing, bird watching, and art for over 200 students each year. These activities create connection between students, their community, and nature in a positive and healthy environment. Students collecting and identifying animals in the wetlands to learn about water quality and how that affects wetland food webs. High school interns bird watching in the wetlands. Over the course of this program, the high-school students earn a stipend while learning leadership and professional development skills. They build confidence and gain valuable career experiences. These memorable experiences develop community and help to prepare them to be future leaders and change makers in the world. Here is an article about one of the Wetland Steward interns in the Santa Cruz Sentinel. Photos by Emily Howard, Director of Educational Programs of the Wetlands Stewards Program at WWW.